Did a "top prosecutor" reveal that he has evidence that Hillary Clinton colluded with Ukraine during the 2016 U.S. election? No, that's not true: Ukraine's top prosecutor said he has evidence that officials in Ukraine released damaging information about Trump campaign manager Paul Manafort with the intentions of helping Clinton's campaign, but he did not make any reference to evidence that Clinton was in collusion with the Ukranians. A top prosecutor has demanded Hillary Clinton be investigated for colluding with Ukraine in her bid to win the White House in 2016. In an interview with The Hill, Ukrainian Prosecutor General Yurii Lutsenko said he has found evidence of a top law enforcement official saying his agency leaked the Manafort financial records to help Clinton's campaign. 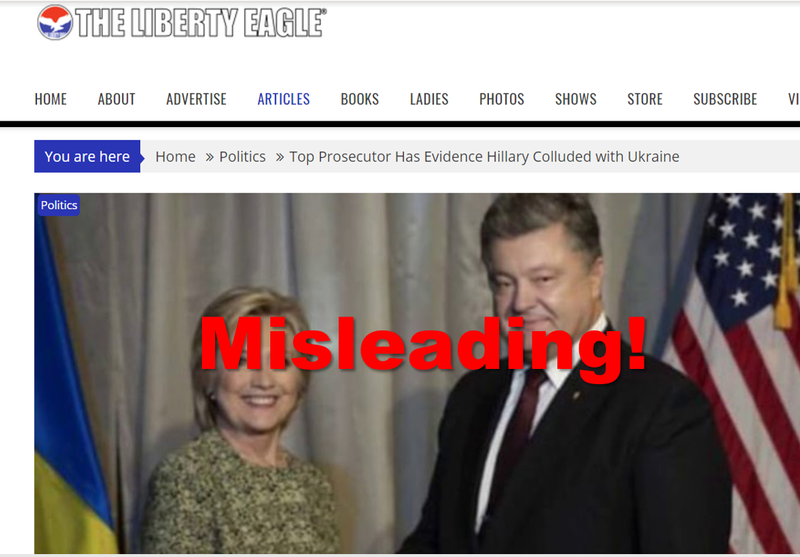 The misleading report is one of several published based on an interview by Hill.TV on March 20, 2019, in which Ukrainian Prosecutor General Yuriy Lutsenko told Hill.TV's John Solomon "that he has opened a probe into alleged attempts by Ukrainians to interfere in the 2016 U.S. presidential election." Lutsenko is probing a claim from a member of the Ukrainian parliament that the director of the National Anti-Corruption Bureau of Ukraine (NABU), Artem Sytnyk, attempted to influence the 2016 vote to the benefit of Democratic presidential nominee Hillary Clinton. View the video of Solomon's interview with Lutsenko at this link. Lutsenko referenced an audio recording of Ukraine officials discussing their intentions to release "black-ledger files that exposed Trump campaign chairman's wrongdoing in Ukraine" during Manafort's involvment in Urkrainian politics. Lutsenko did not say anything about evidence showing Hillary Clinton or anyone with her presidential campaign had contact with them or knowledge of what they were doing. Amid Special Counsel Robert Mueller's probe into alleged Russian interference in the 2016 presidential election, a Ukrainian lawmaker is demanding Hillary Clinton be investigated for colluding with Ukraine in her plight to win the White House. Nowhere in the Hill.TV interview or the text story did Lutsenko "demand Hillary Clinton be investigated." President Trump took notice of Solomon's interview with Lutsenko in a segment with Fox News host Sean Hannity and in a tweet. Paul Manafort served as Trump's campaign chief from May to August 2016. He had previously worked for nearly a decade as a consultant to Ukraine's Party of Regions and its standardbearer, Viktor Yanukovych, according to NBC News. Manafort has been sentenced to serve more than seven years in prison for convictions partly relating to his political work in Ukraine. Short of colluding with Clinton, the Ukrainian leakers motive could possibly have been to embarass Manafort because of his work for their enemy, Yanukovych. A conservative news site that reposts content from other sites without attribution and publishes conspiracy theories.